I haven't fished Waterton Canyon once last year after it reopened, so I thought I would check it out today and see if all the bad news of no fish, bad conditions etc. is true. Waterton Canyon is a part of the South Platte system, arguably the last stretch of this river that can sustain a year-round trout fishery (yes, there are trout caught occasionally below Chatfield Reservoir but I doubt the flow of 0cfs during summer is helping the few trout that escape Chatfield much). Waterton Canyon is part of the Colorado Trail (end or beginning depending on your view) and access to it is either by foot or by bike. No motorized vehicles are allowed. It is apx. 6 miles from the parking lot in Kassler to the dam of Strontia Springs Reservoir (the 6th reservois of 7 before the river hits Denver). I am not much of a walker, especially if I want to start fishing below the dam and 6 miles would take me a while in my waders. With my "tenkara bike", this is much more manageable. And I get a good cardiac workout, too. The reason why I drive all 6 miles up to just below the dam is that the fishing - and fish stock - is significantly better. The flow is typically higher out of Strontia Springs than below the Marston Diversion Dam which is about halfway up. Regulations for the upper stretch are artificial and flies with a 2 bag limit of 16"+. Below the Marston Diversion, regular Colorado regulations and bag limit apply. The weather was nice, lower 60ies as a high, a bit chillier in the morning and the shade of course. At times a bit windy but nothing that would spoil your casting for long. Flow was 32cfs below Strontia Springs and 15cfs below Marston. I thought this would be more of a scouting trip, not having heard really good news about the fishing last year. Luckily, I am happy to report that at least in the upper section trout are still around, spooky, yes, and typical South Platte residents - focused on the small stuff. I still managed to to land 5 nice browns, the biggest around 13" or so (longer than the handle of the Iwana 12' I was fishing with yet. A few more got away, as always. BWO's were coming off and fish were feeding on the emergers. All fish were caught on a gray RS2, fished as a trailer behind a beadhead little black stone fly sakasa kebari and a generic green sakasa kebari. Go figure. The other day I was fishing with Jason of Tenkara Talk and as always, we chatted about new tenkara "stuff" while gearing up. Often times, Jason brings some new cool gear he bought or received for review and this time he brought a bamboo tenkara line holder of the Tenkara Fly Shop. 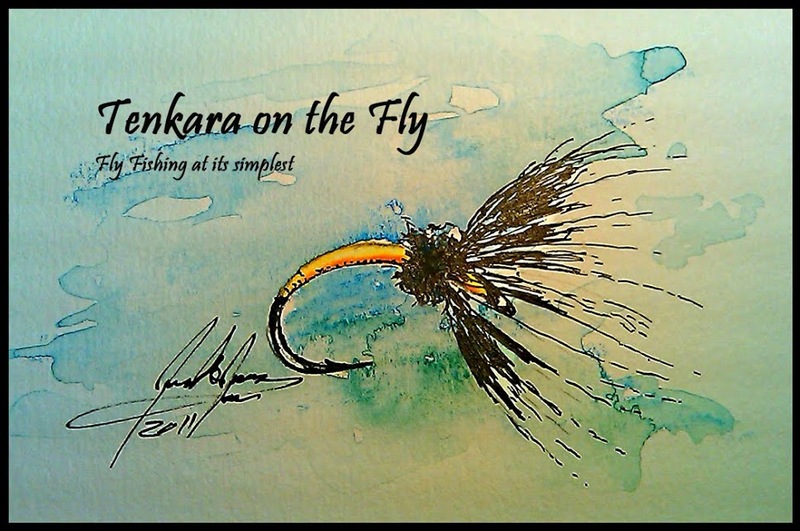 The Tenkara Fly Shop is a pretty new website of Jim Wright in NY State who specializes in "simple tools for the tenkara angler". Jim has constructed some unique rustic tenkara fly boxes, line holders and his signature bamboo fly box (Jason posted reviews here and here). I understand Jim is also working on his own tamo design (sweet looking pictures on the the Tenkara Fly Shops facebook page!) and a bamboo tenkara rod. Back to the bamboo line holder: I always loved the "old fashioned" line holders and what Jason showed me before hitting the water was just that. In the past, I always thought it would be nice to use this type of line holder but it found most of them too long and not really ideal "on-stream". While I was fishing that day, I just couldn't let go of pondering what attributes a line holder should have to be attractive to me. First, it should be fairly short. I don't worry about line kink since I made it a habit to straighten out every line before rigging it to the lilian. Second, holding two lines is not quite enough. What I was looking for was a system I could transport 4 or 5 lines, rigged with flies, that would not take as much space as 5 individual spools. Why not design a line holder that holds 4 or 5 lines instead of 2, right? Size matters so I thought that the ideal dimensions should be around 4.5" long and about 3" wide. This size fits any smaller bag like a chest pack or even my shirt pocket. It is worthwhile to mention that I will be using the bamboo line holder to transport lines I intend or might be using that day. Once on the water, I store the line in use on the rod with a Fuji EZ Keeper system and will put the line back on the bamboo line holder once I am done fishing with the line. I am very much looking forward using this new accessory on my next outing! !